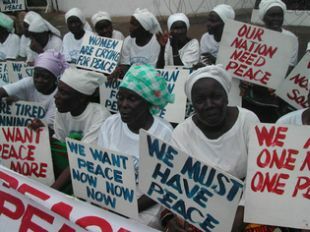 The Mano River Women’s Peace Network (MARWOPNET) was one of the first female led peace negotiating teams in the region of West Africa and they organized a system of diplomacy between the Liberian, Guinean and Sierra Leonean heads of state. MARWOPNET met on June 8, 2001, when the first general meeting was organized by Femmes Africa Solidarité and the African Women’s Committee for Peace and Development. The meeting which took place in Monrovia, Liberia was attended by women from Guinea, Liberia, and Sierra Leone including Mary Brownell, founding member of MARWOPNET and Madame Ruth Perry, former Liberian head of state. Also in attendance were representatives from The African Union, the African Economic Community, the Nigerian government, and the United Nations Development Program. These women met because they understood the disproportionate impact of civil wars and armed conflict on women and children in the region which had seen over 300,000 deaths in the last decade. They saw themselves as engaged in bringing peace to the region through conflict resolution and community reconciliation. The network consisted of religious leaders, politicians, union members, businesswomen, homemakers, and educators including founding leaders Ms. Kaba Hadja Saran Daraba (President), Theresa Leigh Sherman (First Vice President), and Agnés Taylor Lewis (Second Vice President). MARWOPNET established an executive board of twelve representatives from the Mano River sub-region; three from Sierra Leone, five from Guinea and four from Liberia. They agreed that the Presidency of the organization would rotate among representatives of the three member nations. The MARWOPNET founders also created five technical commissions that work in the areas of fund-raising, resource mobilization, finance, programming, and communications. In one of its earliest examples of success, the Liberian Chapter of MARWOPNET brought together President Charles Taylor (Liberia), President Lansana Conté (Guinea), and President Ahmad Tejan Kabbah (Sierra Leone) for a summit in 2002. The following year, the organization was a signatory member of the Liberian Comprehensive Peace Agreement, an agreement that ended a civil war that had begun in 1989. For its efforts, MARWOPNET was awarded the prestigious United Nations Prize for Human Rights in 2003. In 2004 MARWOPNET organized a youth seminar in Conakry that included over 60 participants from across Africa. Later in the decade, MARWOPNET began training market women in conflict resolution, primary education, and entrepreneurship. In 2011, MARWOPNET trained women served as poll watchers in the highly contested Liberian Presidential election. In 2011 it launched the MARWOPNET Peace Radio in Sierra Leone. In 2012, MARWOPNET joined with The Global Network of Women Peacebuilders and The National Organization of Women, to conduct workshops in Sierra Leone on United Nations Security Resolution 1325 (which calls for inclusion of women as peacekeepers) and United Nations Security Resolution 1820 (which focuses upon ending gender based violence in conflict zones). These workshops were designed to educate women in war-ravaged Sierra Leone on international legislation and the ways in which they can participate in conflict resolution and peace building. MARWOPNET which is headquartered in Freetown, Sierra Leone, has an online journal, Voices of Peace, which includes first person narratives, poetry, art, and testimonials from women and men who have been affected by war and conflict. MARWOPNET mobilizes women by building networks of professionals, organizing sub-regional meetings, promoting projects that focus on youth, and collaborating with other peacekeeping organizations. Mano River Women’s Peace Network / Reseau du femmes du fleuvre mano-pour la paix, http://www.marwopnet.org/welcome.htm; Mano River Women’s Peace Network Journal, http://www.marwopnet.org/voicesofpeace.htm.